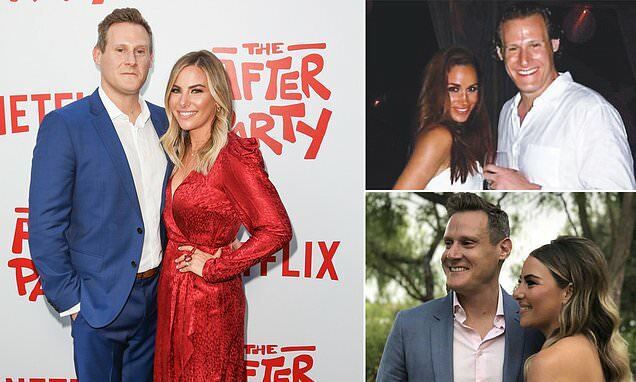 Meghan Markle's ex-husband, Trevor Engelson, celebrated his impending nuptials with a bachelor party in Miami earlier this month, but it seems like his bride-to-be had a more reserved last hurrah. The 42-year-old director's fiancée, Tracey Kurland, had a bridal shower at Ivy at the Shore in Santa Monica on Saturday, just weeks after his bachelor party in Florida, Us Weekly reported. Tracey, 32, and her guests enjoyed pizza, mini crab cakes, and tuna tartare as appetizers. For the main course, they had a choice of grilled vegetable salad, grilled salmon, penne with fresh tomato sauce, or a hamburger with or without cheese. It's unclear if Tracey will be taking a cue from her future husband and having her own bachelorette party before they tie the knot. Trevor proposed to Tracey, the daughter multi-millionaire banker, in California's Napa Valley in June 2018, two weeks after his ex-wife married Prince Harry. In October, it was reported that the two tied the knot in a low-key ceremony at a private home in Hidden Hills, California, the same affluent suburb of Los Angeles where Kim Kardashian and Kanye West live. It's possible that the couple could be gearing up to celebrate a larger, more elaborate second wedding, or the intimate celebration was actually an engagement party. Tracey's parents, Stanford and Sheila Kurland, live in Hidden Hills but it was unclear if it was held at their home. In social media pictures, which were taken down shortly after they were posted, Tracey can be seen wearing an off-the-shoulder, mid-calf white dress, while Trevor has on a gray suit with a pink shirt and no tie. The event was reportedly decorated with strings of traditional Mexican paper banners that hung across a swimming pool and there was a tequila bar for guests.